Continuing its plans for expansion, Sofology has opened its 42nd store at Gateway Retail Park, Plymouth today. 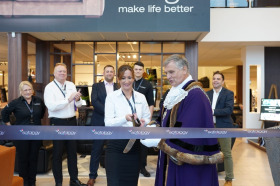 The Plymouth store marks the first South West opportunity, establishing the continued success of Sofology as a brand. Located over a 20,000 square foot area, the new store boasts 80 intricately interior designed room sets that offer inspiration and ideas for Sofology’s exclusive sofa ranges. With products organised into dedicated collections, the new store will showcase each range in a beautifully designed ‘in-home environment’. Sofology will also take this opportunity to introduce their new collection, ‘Private Label’. Senior buyer at Sofology, Julie Pearson is excited about this new addition: "Our most exclusive and luxurious collection of sofas yet, the Private Label collection includes some of my personal favourite pieces. Envisage the ultimate in luxury - soft, deep seats, beautiful fabrics and exceptional craftsmanship. These ranges are designed to make coming home feel really special." Passionate about the exclusivity and quality of their products, the craftsmanship design and little extra details that make life better, plus the unique customer experience that only Sofology offer, the new South West store will continue their customer centric, no pressure retail experience. Customers will be greeted by Sofologists, whose only aim is to help you feel at home on a sofa you love. To celebrate the new store, Sofology will be offering fun in-store events such as face painting, balloons, chocolates and champagne on Saturday 13th October from 10am.